I am probably not alone in noticing that the mainstream media's deplorable unfair treatment of Israel is strikingly similar to how it treats the Tea Party. In both cases, the MSM has chosen a side, spinning its reporting to brand the victims intolerant, racist and hate-filled aggressors. Israel was minding its own business when it was attacked by Hamas, showering Israeli towns with thousands of rockets. Hamas seeks the total destruction of Israel. If it were not for Israel's Iron Dome missile defense system, millions of Israelis would be dead. Now get this folks. It does not get more cold, calculating and satanically evil than this. Hamas stores and launches its rockets from civilian sites, schools, hospitals, mosques and more. Prime Minister Benjamin Netanyahu described the situation perfectly when he said Israel is using its Iron Dome to defend its people from missiles launched by Hamas who use their people to shield their missiles. http://bit.ly/1k2pbPv So when Palestinian civilian casualties obviously far exceeded those of the Israelis, the MSM went postal on Israel; machine-gunning Israel with negative stories. The truth is Israel has shown remarkable compassion and restraint, going above and beyond to avoid harming civilians. Before bombing a Hamas target, Israel texts, makes phone calls and even fires warning firecrackers to alert civilians, begging them to evacuate the premises. Who in the world fights a war in such a humane manner? Still, the MSM flooded the worldwide airways with images of suffering and dying Palestinian women and children, purposely deleting crucial facts to misrepresent the truth to shape public opinion against Israel. http://bit.ly/1lOpF78 This is exactly what the MSM has done to the Tea Party. By the way, Israel's lifesaving Iron Dome system is the same technology launched by Ronald Reagan (Strategic Defense Initiative) that was heavily mocked by liberals and the Democrats. Sen. Ted Kennedy laughed at Reagan describing his initiative as a misleading Red-Scare tactic and reckless Star Wars scheme. The Tea Party which consist of mostly middle-aged adults, seniors, parents and grandparents was birthed in response to Obama's shock-and-awe attacks on our freedoms and unprecedented unlawful power grabs. Obama's desire to fundamentally transform America was hidden in plain sight before his historic election. The millions of white voters who put the first black man in the White House were blinded by MSM hype and their desire to make amends for America's sin of slavery. Because the MSM is in favor of Obama's transformation of America, MSM fellow "transformers" demonized the millions of white former Obama supporters in the Tea Party. The MSM's goal is to brand all opposition to Obama's socialist/progressive agenda hatred for a black president. Blatantly and shamelessly the MSM is shaping public opinion against the Tea Party, instilling division and racial hate. I pray that our Tea Party leaders will take a cue from Israel's strong, brave and courageous Prime Minister Benjamin Netanyahu. Regardless of worldwide public opinion and slings and arrows launched by the MSM, Netanyahu will not be intimidated into not defending, protecting and making decisions in the best interest of his people. We do have a hand full of character driven leaders who have consistently displayed the same backbone as Netanyahu. My list of Tea Party conservative all stars include Sarah Palin, Ted Cruz, Mike Lee, Ken Cuccinelli, Steve Lonegan, Mike Sullivan, Trey Gowdy and Joe Carr to name a few. These people are human beings. They need our encouragement and support to remain strong; keeping their heads down to avoid the Left's punches while landing right hooks to the head of our evil relentless Nemesis. The MSM obviously seeks the destruction of Israel and the Tea Party. Like He is with Israel, God is on the side of the Tea Party. 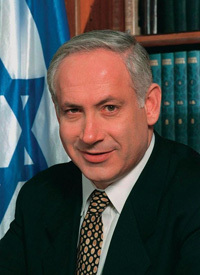 I thank God for giving Israel Netanyahu. With great anticipation, I await the emergence of our charismatic conservative leader who will boldly articulate conservatism; someone who will lead the charge to restore our great nation to a new day of American Exceptional-ism.